informed by research demonstrating the benefits of intentional contact with nature, a care forest is a stewarded space that promotes human and environmental restoration and balance. From simply clearing a small grove of trash and being friendly to passers-by in a public park to immersive therapeutic experiences hosted on private woodlands, the size and scope of how each steward chooses to express their care is up to them. 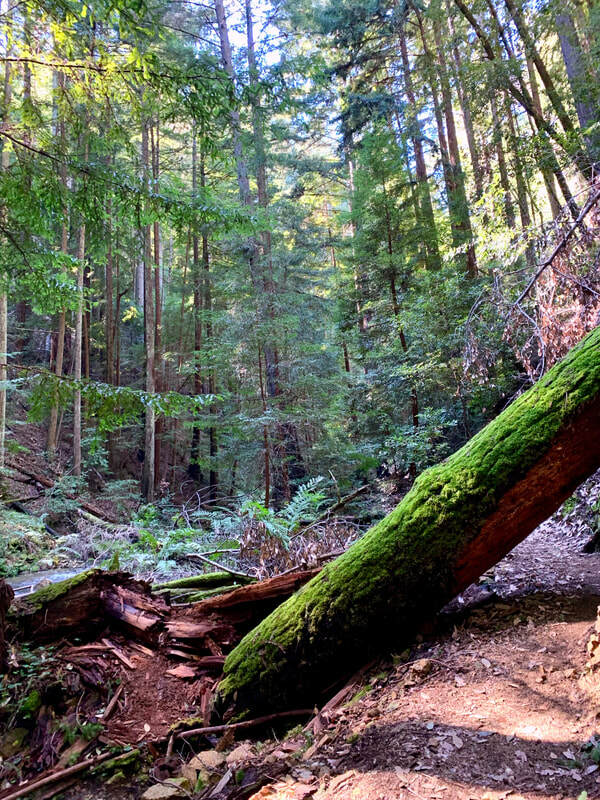 The Care Forest Project's pilot location is in the Santa Cruz Mountains of California in a private Redwood forest. We have access to 60+ acres of spectacular trees, trails and future backcountry camp sites for the cultivation of our vision. This concept has the potential to make an impact on the lives of people who are in need of respite, support, deep listening, and education to help support their mental well-being. The Care Forest Project is intended to be replicated with support, training, and resources for people who feel drawn to care forest work. The Care Forest Project addresses several complex crises based on a a clearly-defined set of values and beliefs. You can't love what you don't know, and if you have never been in the presence of a tree, it's hard to get fired up about wanting to protect it, or making choices that support the restoration of the forest along with the restoration of the human. Revenue from guests visits and other efforts can generate income for small timber lot owners who host or allow care forest activities on their land. Therapeutic visits to the forest can be guided or unguided, and the content of themed workshops arises from what each individual care forest community needs and what the nature guide, leader, or teacher wants to share. The forests have minimal human structures and distractions; the ideal care forest is far from wifi to give guests a chance to unplug, connect, and restore. Our work is part of a collection of projects and businesses tied together by the intention to provide space for self-refection and connection. Visit jukoholiday.com and easemountainyoga.com to read about other things we do.